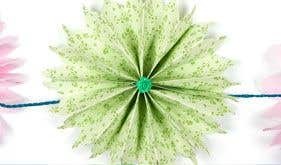 Choose a sheet of spring paper. Cut the sheet in half (hold it horizontally and make a vertical fold to find the centre and cut). Make a fold along the shortest edge about 1.5cm in. 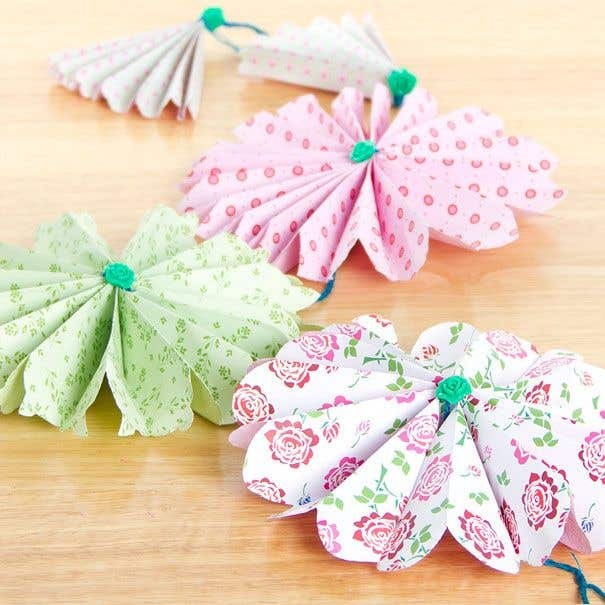 Fold in the opposite direction to make a concertina type fold (like making a normal paper fan) and keep folding back and forth until you reach the end. Fold each in half. Do the same to the other piece. These two pieces will make one fan. 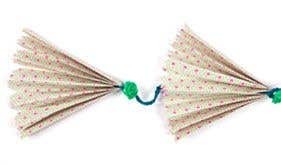 With the pattern facing up, put the two fans side by side to join them together. Pop a piece of double sided tape on the edge of one and attach it over the other (so the join is hidden). 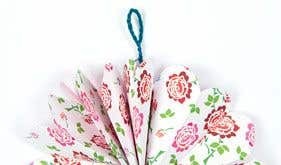 To create a petal type shape around the outer edge of your fan cut the ends so they are curved, or try a pointy triangle for a different effect. You can experiment with these the more you make. Open the fan up on both sides until they meet in the middle and fix into a circular shape using double-sided tape. Make two more large fans in the same way. Cut different shapes into the outer edges to make each fan look unique.